Published on 16 June 2012. 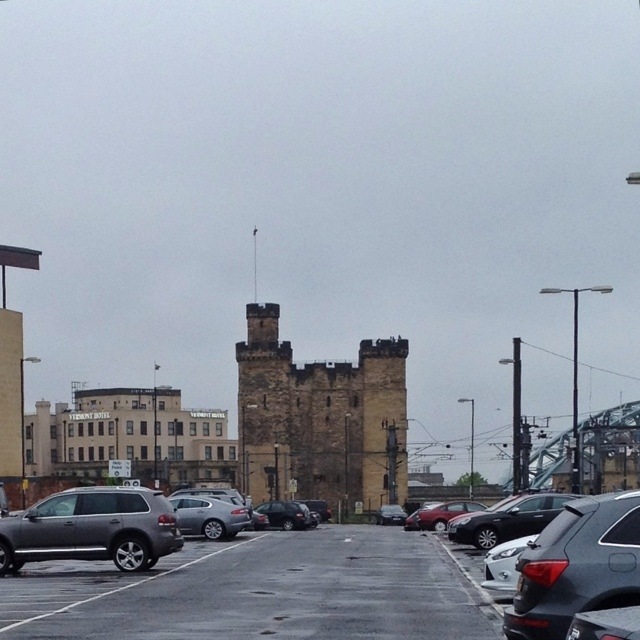 This is part of the answer: the Castle Keep of Newcastle upon Tyne, built 834 years ago by King Henry II. Well, not so much by Henry as on his orders, I imagine. The Black Gate, the castle’s gatehouse, also still remains – though that was built a little later, by Henry III. I doubt either Henry foresaw that the East Coast Mainline would one day cut through their castle’s grounds – it’s this development in the mid 19th century that led to the destruction of most of the Castle’s buildings except for the keep and gatehouse. Clearly, planning permission for railways was easier to come by 200 years ago than it is today, going by the furore over HS2’s route! If you are visiting Newcastle and want to pop in, it’s open almost every day of the year, is free for kids under 18, and costs only £4 per adult. Interestingly, the folk who currently look after the keep are almost as ancient as the building itself – the Society of Antiquaries of Newcastle upon Tyne dates back to 1813, and is the oldest antiquarian society in England. They also operate a bagpipe museum in a former ladies’ toilet in Morpeth, which I’m afraid I’ve absolutely no desire to visit. This 1,689th post was filed under: Photo-a-day 2012, Newcastle-upon-Tyne.